Nebraska Nice–part two « Hercules and the umpire. Mike Riley, the former head football coach at Oregon State, was hired to lead the Cornhusker football program. See here from ESPN. Remember that Nebraska has one state-wide newspaper, the Omaha-World Herald–sometimes called the “Weird Herald.” Remember also that Nebraska has fewer people in the entire state than the folks (like my brother) who populate metropolitan Cleveland. 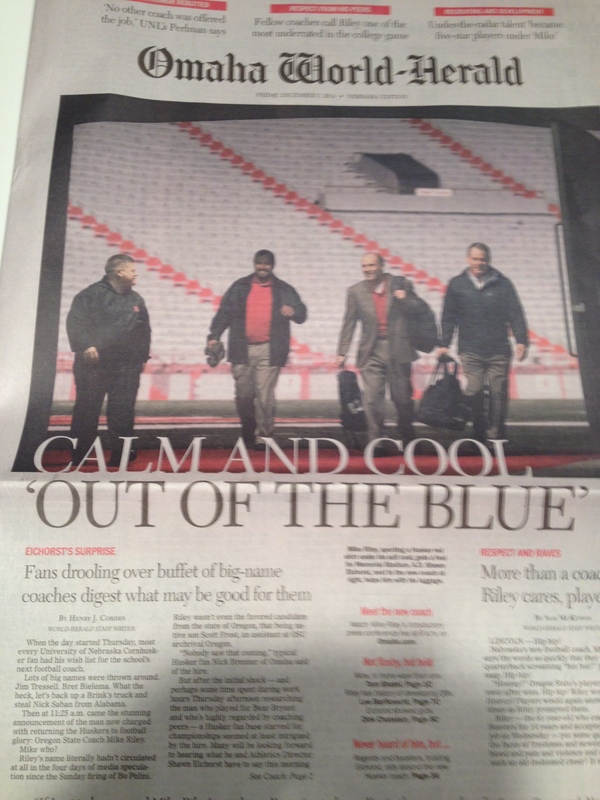 I wrote a snarky piece when Nebraska fired Bo Pelini. It was sarcastically titled, Nebraska Nice. It turns out that I was right, sorta. Nebraska is nice. That makes me glad (and sheepish for writing the earlier post). PS Why you ask is all this football crap relevant to this blog? If you don’t know the answer to that question, then you have no clue why I write this damn thing. It is an interesting hire, albeit a surprising one. I trust you saw Faux Pelini’s brilliant welcome letter of advice to Coach Riley. He is not sheepish about his earlier snark. Gosh, I am going to miss him. No need to feel sheepish about the previous post, Judge. Involuntary job terminations are seldom “nice” events and lead to emotional responses. The bottom line is that Bo will bounce back nicely into the game somewhere at some time, having reaped the benefit of up to 51 months of $150,000 per month compensation on his “buy-out”. Makes it kind of difficult for the common man to feel “nice” or sorry about that. The new fellow, Riley, was impressive in his first appearance before the media and the great unwashed fan base. Methinks he has a chance to do well in the so-called Husker culture. Reflecting upon the “unwashed,” I like the old days. Saturday night was the time for the weekly bath, and a pressed flannel shirt. I have no idea why this came to mind, but you get the point, I think. I’ll miss Coach Cat, too. 😉 Brady Hoke, out at Michigan, is getting good reviews from present and former players about what a good “father figure” he was/is to them. The problem was his record, not his character. Brian Griese is a member of the search committee for the new head coach. Lloyd Carr (and many others) are hoping Jim Harbaugh will leave SF and return to Michigan. For what it is worth, and it is not worth hardly anything, I have a low opinion of Jim Harbaugh because of what I perceive to be his lack of sportsmanship. But, to each his own. Like Coach Cat, he does appear to have a sense of humor. His brother John appears to be more even-tempered and likeable, but I hate the Ravens. Yes, he does! Good for him (and you too). All the best. Nebraska and Michigan (the college football teams, not the states) have at least one thing in common. They both fired their coaches, even if they were considered to be fine role models. Nebraska has made the move to a new coach already, but Michigan apparently is still contemplating enticing Jim Harbaugh to Ann Arbor. Notice that this article about the Michigan coaching situation mentions Nebraska and describes the new coach as an under-the-radar guy and a good coach who happens to be 61. I wish Nebraska well on its next season with a new coach. Also, because you just celebrated a birthday which still keeps you in the 60’s age range, I think you will agree that hiring a 61-year-old coach may be a good thing!